The adventure begins with The Big Bang symbolizing primitive man embarking on a never-ending journey. 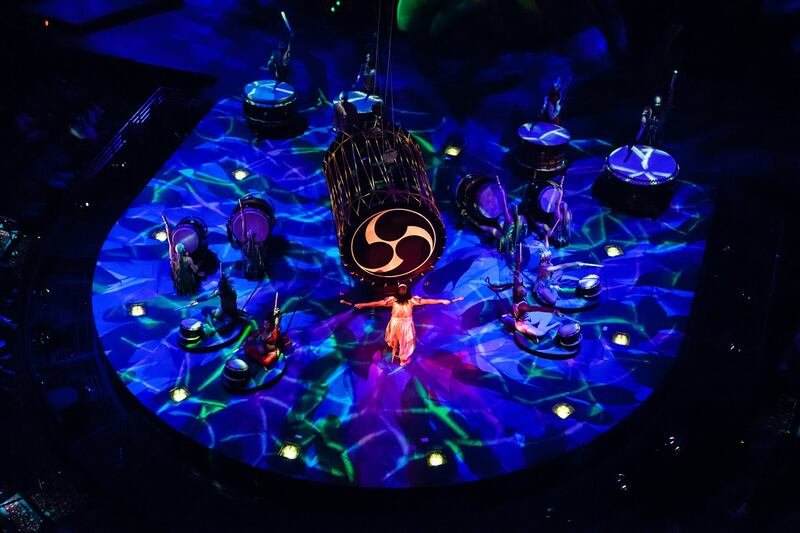 The opening also juxtaposes the characters and contexts in a way that creates the universal life cycles of Mystère®: the primitives on the drums, the renaissance Archangels and the technical scenography coexist seamlessly. 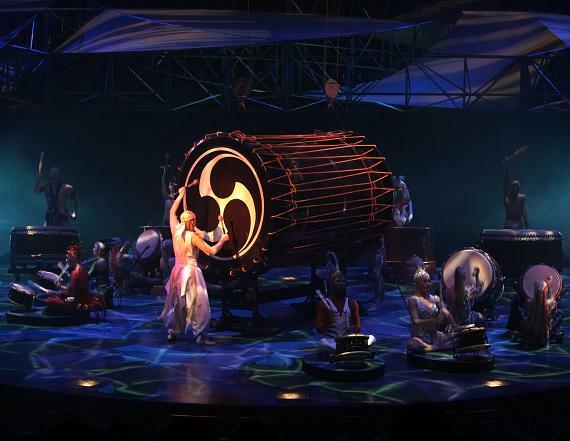 The Taiko's reappearance in the conclusion is a reminder that the future is built on the memory of the past. 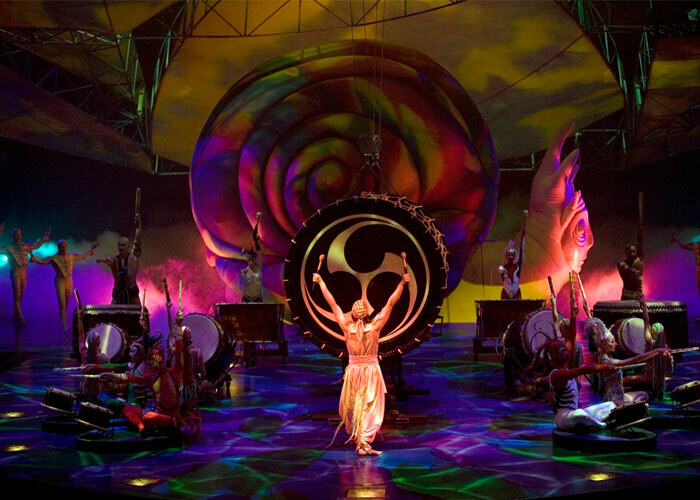 Whenever I ask someone what they remember most about Mystère, the answer is usually- "The drums." 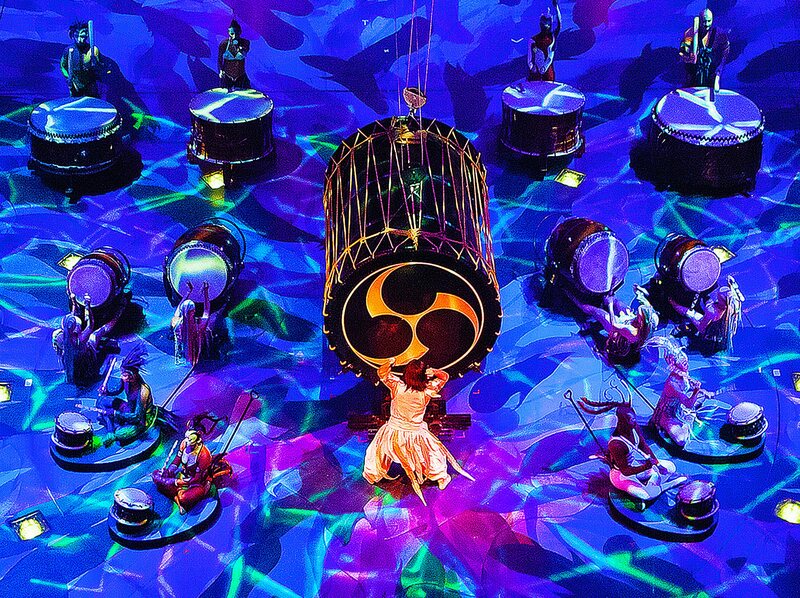 Mystères' percussionist, Pierre Dubé, traveled to Japan to learn the fine art of Taïko drumming technique from Kodo, a Taïko performing group from Sado Island. 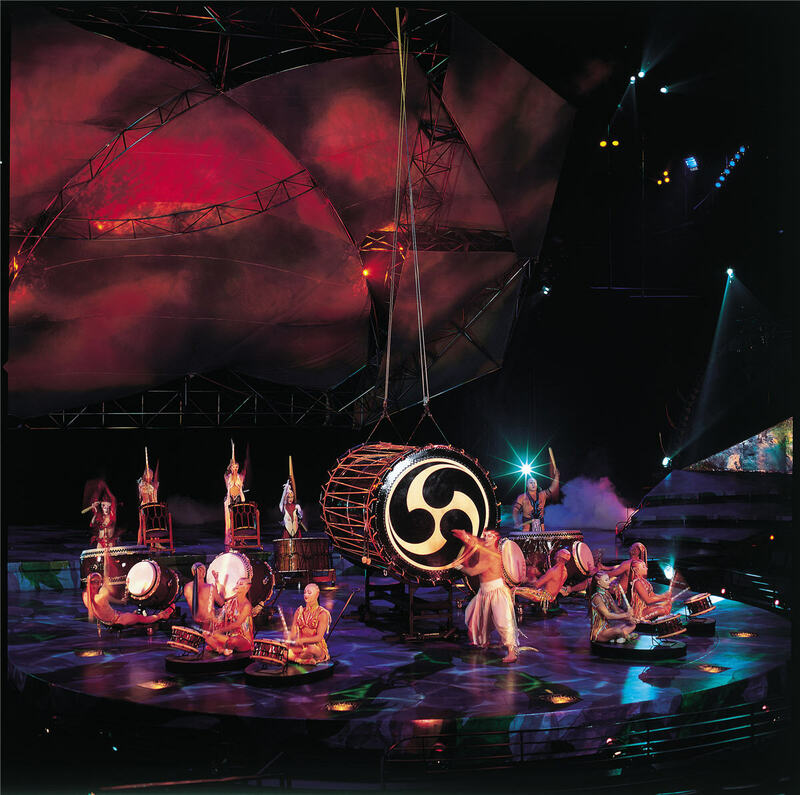 Pierre returned to develop the act, also called "Taïko," in which he coached a troupe of twenty-plus cast members the drumming complexities. The result is a thunderous poly-rhythmic delight that features Monsieur Dubé soloing on a drum the size of a VW mini-bus. The climax of his solo is a hushed drum roll that requires complete concentration while his wrists pulsate with incredible nimble action. He then pounds like thunder and the troupe rejoins the ritual. 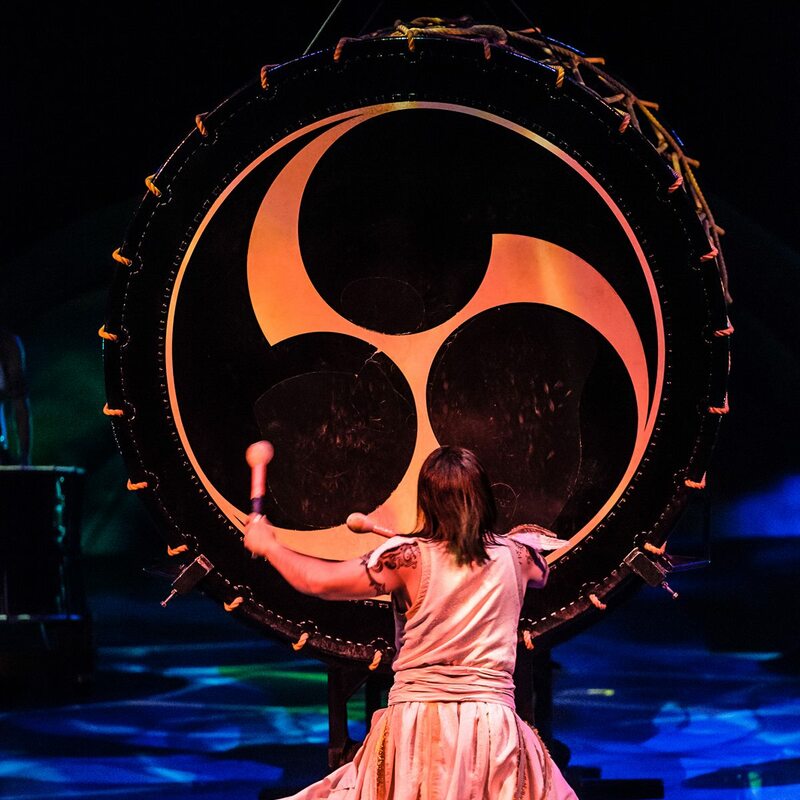 The Taïko drum was first used in Saltimbanco only to be elevated to such fine art here. Consequently, the vibrations from the drums resonate throughout the Treasure Island Casino-Hotel and sometimes... set off the alarms in the shops! Thankfully, these fine instruments can be heard on the Mystère Live CD.